Published in the April 2019 issue of ParishLife. 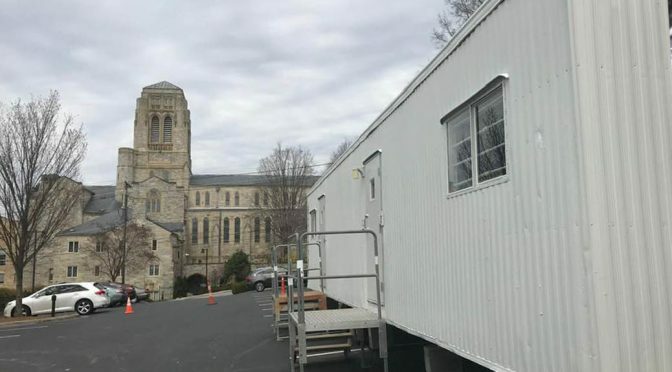 With ReNEWal campaign solicitations underway parish-wide, the campaign’s two primary capital projects are progressing. I.L. Long Construction Company began work on the 875 West Fifth Street building on January 29, and the Christman Company, construction manager for the 1928 church building restoration, set up its construction office in St. Paul’s upper parking lot on March 13. Interior walls will go up next, and new windows will be added to the east side of the building. The front entrance will be reconfigured to restore it to its original design. The building’s exterior will be cleaned and re-caulked. “That’s all we have to do,” said Larry. “The brick, mortar and roof are fine. With a Certificate of Appropriateness from the city’s Historic Resources Committee, a building permit, and Christman’s office now set up, restoration of the exterior of Ralph Adams Cram’s church is about to begin.